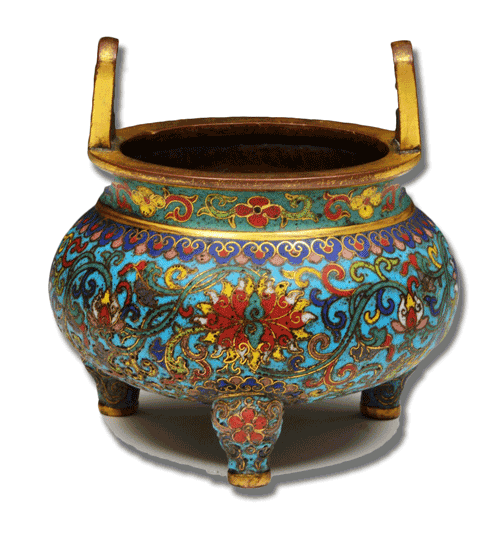 Cloisonné is a term used to describe a specific form of decoration for metalwork. The style incorporates enamel, glass, gems, and/or other materials. Compartments are created first with silver or gold wires or thin metal strips. Then the inlay materials are affixed between the compartments. If enamel is used, it is applied in a paste form, then kiln-fired. Ancient use of cloisonné was for jewellery, buttons, small objects, and weapon handles, and geometric designs were most frequent. By the time of the Byzantine Empire, thinner wires were used for greater design flexibility, and pictorial or religious images in enamel became popular. Chinese artisans began using this technique in the 1300s on large items like vases and bowls, and this practice continues today. In the 18th century Western artists began imitating the Chinese style of cloisonné. Japanese craftsmen started using the Chinese cloisonné methods in the 1830s. Their mastery of the technique produced beautiful wirework and exquisite enamelling. Japanese cloisonné was used for jewellery, sword handles and fittings, architectural pieces, and writing instruments. 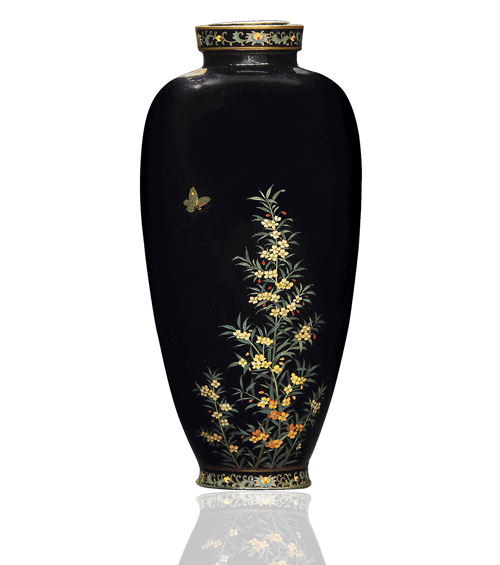 In the 1850s the popularity of cloisonné surged as Japan began trading with Western countries. Demand for Japanese art rose quickly in America and Europe during this time. In the 1870s Japanese artists began incorporating new techniques after viewing Western art. They experimented with different enamel transparencies and mirror finishes, which added realism and three-dimensional effects. Each piece is unique because the enamel finish varies slightly. Common subject matter includes dragons, koi, butterflies, chrysanthemums, wisteria, and cranes. Chinese and Japanese artists trained for many months to perfect their wiring and enamel techniques, which makes their pieces highly sought after by collectors. Some artists used the wirework as part of the art, simulating brushstrokes to enhance the theme. Prices can range up into the six-figures for the rarest pieces in top condition. If you would like a free, no obligation valuation of your cloisonne please use the form below. You can also email details about your cloisonne to [email protected] or call us on 01270 440357.